<<<<<Liquid goods cannot be shipped internationally. If you need a foreign friend, please ask your friend to buy in Taiwan>>>>> ❖❖❖❖❖Storm Glass Bottle Weather Bottle Storm Bottle ❖❖❖❖❖ Customized color / custom text / transparent / Miss Mia handmade https://cdn01.pinkoi.com/product/1zIeoPLd/17/500x0.jpg The world in the weather bottle Like the emotions in everyone’s heart Need patient waiting to bloom the most beautiful crystal https://cdn01.pinkoi.com/product/1zIeoPLd/869/500x0.jpg Observe the crystallization of the weather bottle every morning at the window. When I see the beautiful crystal, I will feel very good all day. 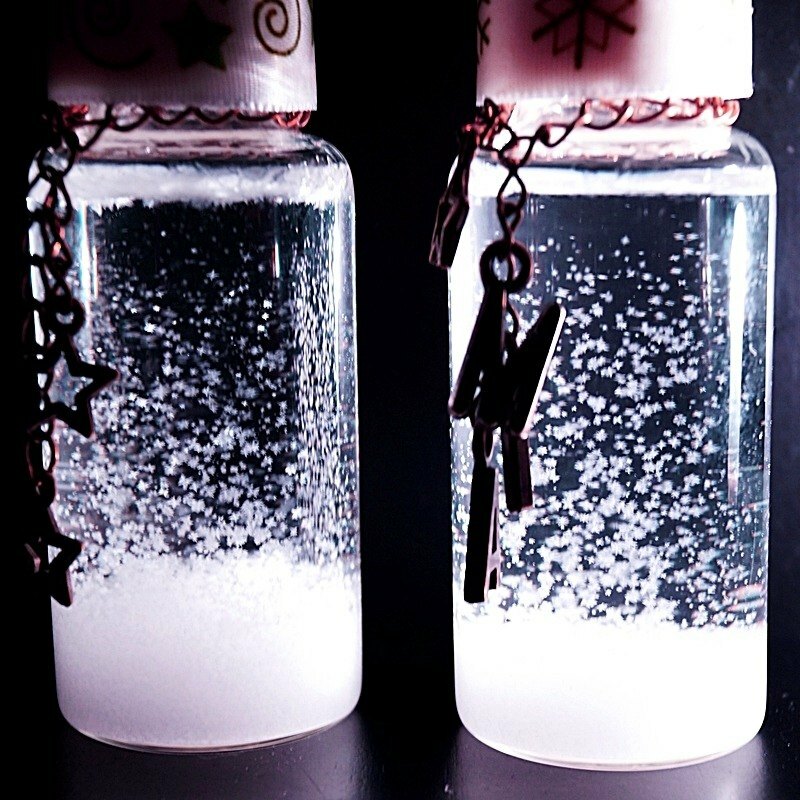 https://cdn01.pinkoi.com/product/1zIeoPLd/0/19/500x0.jpg It’s snowing~ Weather bottles produce different crystal changes with pressure and temperature. Looks like a small world in the snow https://cdn01.pinkoi.com/product/1zIeoPLd/897/500x0.jpg Material: water, alcohol, potassium nitrate, ammonia chloride and camphor + glass + all kinds of hardware (The metal cap is easy to be eroded, and the cork is easy to leak and volatilize. Therefore, the plastic cap is used, and the "3 lanes" is completely sealed. The long-term guarantee is also to ensure no leakage or evaporation. Size: Transparent box: 10 x 7 x 3.5 cm Glass bottle: 7.5 x 3 cm (too narrow and too low a bottle will not be able to bear a beautiful crystal flower) Packing: There are currently two types of "coffee gold" and "silver" (the cover is currently "satin silver stars") Shipping: International shipping and post office are not suitable for sending liquid goods, so the rate is super-commercial pick-up or home delivery Free customized text, the gift is the most intimate! https://cdn01.pinkoi.com/product/1zIeoPLd/4/500x0.jpg Text, numbers and accessories: (Free to match 8 free, intimate reminder: Hang too many weather bottles that will affect the United States and the United States) A string can be up to 5 letters or small ornaments; can be divided into 1~3 strings! In addition to "letters" and "numbers", there are also small accessories "opening stars" "small bells" "Handmade" "solid stars" and "small love" Please refer to https://www.pinkoi.com/product/10Vwwg0u (You don't need to add another purchase, you can add a constellation tag to Mia.) ❖❖❖❖❖❖❖❖❖ Miss Mia intimate little 叮咛❖❖❖❖❖❖❖❖❖ ❖Cannot be transported or transshipped internationally, and the post office cannot send liquid goods, so the rate is super-commercial pick-up, the shipping cost in the outlying islands is not the same, please contact Mia before placing an order. In the process of making blown glass, there will be some small flaws, and not every one will look exactly the same! 纯度The purity of raw materials has a great relationship with whether it will crystallize. Mia will wait until the weather bottle is sure to crystallize before sending it. Please rest assured! ❖ If you need to modulate custom colors, please refer to this store. https://www.pinkoi.com/product/ACArjx9R?category=5 Patients with vomiting bean disease will have severe allergic reactions, please avoid contact!